We see Draco in [AFSPA,DAA & PSA] lawmakers! Draco [7th century B.C] was an Athenian lawmaker whose code of conduct prescribed cruelty and severity.His constitution endorsed laws based on homicide and abuse.Now centuries later,we can still find lawmakers with same visions of brutality.Thus the legacy of ' Draconian- like' laws continue and India is no exception! We, as Kashmiris, firmly believe that territorial integrity is more important than national self-determination. The years of foreign rule, religious movements, and spiritual discoveries in the land of India has given a way to a rich potpourri of social habits, festivals, and customs.This diversity is viewed with' intense pride' by the leaders in India but there is an inherent fallacy in it.Although,The Constitution of India guarantees full freedom to every individual,leaders have practically done nothing to safeguard cultural and ethnic rights. 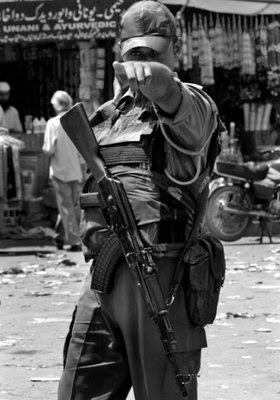 When a community is discriminated in institutionalizing language,education,jobs and civil liberties,the idea of ethnic nationalism comes to practice.There are States in India which demand self-determination on the basis of these variances & forced subjugation.Thus,the largest democracy in the world,the State of India has designed felonious laws to counter these insurrections. These Draco chauvinists lawmakers have endorsed a legal philosophy which dishonor fundamental human rights with immunity from legal accountability.Armed personnel's can beat a person to pulp without any warrant, can endorse arbitrary detention, rapes, torture,electric shocks, simulated drowning & They have been shielded by clauses in these Draconian-like laws that allow initiating of a prosecution, without the permission from the central government. Such permission is rarely granted in any world order today. Indians too have protested against these practices but their voices have been choked in cycles.The actual fact is that the government has chosen to ignore recommendations from its own experts and they are not interested in providing any accountability and justice.It also shows little evidence that the military is fully and effectively prosecuting soldiers and officers for abuses committed by them.None have been tried a court martial in military courts.This fact speaks volumes about atrocities & provoked militancy in various parts of the country. Under relevant international human rights and humanitarian law standards there is no justification for such acts.By its form and in its application,these laws totally violate the 'Universal Declaration of Human Rights'. If leaders in India want any sense to prevail in their political machinery,let these laws be revoked in order to counter more violence and humility.